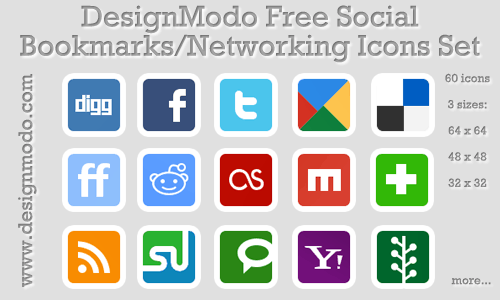 Icons: aim, aol, bebo, bing, blinklist, blogger, delicious, designfloat, deviantart, digg, dribble, dzone, ebay, facebook, feedburner, flickr, foursquare, friendfeed, friendster, furl, gmail, google, googlebuzz, gtalk, hi5, identica, lastfm, linkedin, livejournal, magnolia, metacafe, misterwong, mixx, msn, myspace, netvibes, newswine, openid, orkut, picasa, plurk, posterous, reddit, rss, sharethis, skype, slashdot, sphere, sphinn, spotify, stumbleupon, technorati, tumblr, twitter, vimeo, wordpress, yahoo, yahoobuzz, yelp, youtube. nice icon set! You should consider adding the web blend icon too!